It is “Way Of Eating”. We say WOE instead of saying ‘diet’. 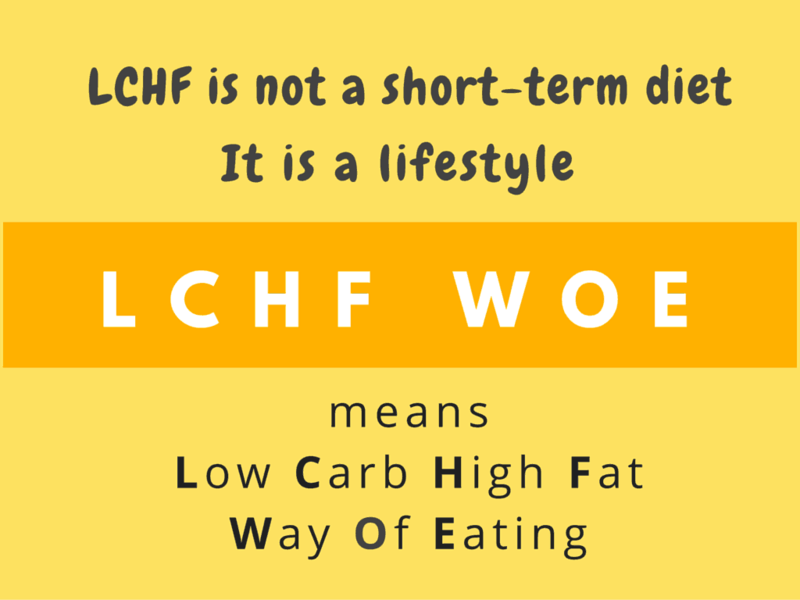 Many LCHF followers use this term. ‘Diet’ actually means ‘way of eating’, but is nowadays understood as ‘crash diet’ or ‘fad diet’ or ‘changing eating pattern for a few days to achieve weight loss’. So WOE is used in order to make it clear that this is not some short-cut method to achieve weight loss after which you can go back to the old, unhealthy eating patterns. This is a life-style. Carbs is short for ‘carbohydrates’. It’s a word often used in the website, and since I’m lazy to type the whole word, I’m going with ‘carbs’. 3. Do I have to eat foreign foods? Can I have Indian food? You don’t have to eat foreign foods. You can cook meat and vegetables like you usually do. Just cut out the unnecessary carbs. Your carb intake should preferably be from vegetables, not grains. Btw, this is not a sarcastic question. When I started, I had read a couple of books and tried to follow the recipes in those books. At that point, my brain was too busy trying to wrap itself around the idea of eating fat and refusing carbs that I couldn’t think straight about food preparations. For some time, I was just eating tuna salads, omelettes and attempting to make beef bourguignonne and chicken parmigiana!! Then, my grey cells started working again, and the bulb went on over my head, and I started eating like a normal Indian. 4. What is flour? Does it contain carbs? Flour is usually the powder-form of grains. It has a maximum of carbs. Maida flour, wheat flour, rice flour… and any other flour made from grains and sometimes even legumes are better avoided. Maida is bleached wheat flour, treated with chemical bleach. After reading this article and a few more about the bleaching of wheat flour, I can’t imagine why we would feed ourselves and our children cakes, pastry and other sweets, almost every day. The product is barely a century old in the world. I don’t know when it was introduced in India, but it was not until a few decade back I guess, because it was called American flour (அமெரிக்கன் மாவு shortened to மெரிக்கன் மாவு) around 30 years back when I was a kid. Almost all food is treated with chemicals (including meat), so we could try to reduce the frequency of eating chemically treated foods, and try to go as organic as possible. Some people use nut flours (almond, walnut flour), some others use coconut flour. These flours are much lower in carbs than grain and legume flours, but use them based on your tolerance for carbs. If you’re highly insulin resistance, you might not want to use them too often. 5. Can I survive on this WOE (way of eating)? Yes, I have survived and so have many people all over the world. I started this way of eating in March 2014. 6. But carbs are essential for human living, no? No! As far as I’ve read, there are no essential carbs. All body cells, including brain cells, can survive well on ketones. Cancer cells are the only cells that absolutely need glycogen to survive. 7. Can a vegetarian adopt this WOE? Authors of “Always Hungry?” and “New Atkins for a New You” say that both vegetarians and vegans can do it. I guess it’s easier for people who consider eggs and fish as vegetarian food (FYI, there are high-caste Indian vegetarians who consider fish and eggs as acceptable). Personally, I’m not quite sure if a vegetarian/vegan LCHF can be sustained in the long run. Vegans may find it more difficult than vegetarians to get good sources of fat. Please try it and if you fare well, create a blog or website and spread the word. It will be useful to other vegetarians and vegans. 8. I have diabetes. Can I do this? If you are on medication for diabetes, you have to monitor your blood sugar levels and reduce medication accordingly. It might be better for you to consult an informed doctor who understands this WOE. LCHF WOE naturally reduces your blood sugar levels. Medications artificially reduce your blood sugar levels. If you do both simultaneously, you’ll reduce your blood sugar levels too much and risk going into hypoglyceamia. If you have diabetic tendencies or a family member has diabetes (which is statistically highly probable), you should know by now what it means. If not, please google it yourself. 10. Why do we get fat? Because we eat too much, right? WRONG. 11. Won’t I become fat if I ate all this fat? Look at our photos and the test results. We ate dietary fat and lost body fat. 12. How about traditional Indian grains, especially millets/small grains/சிறு தானியங்கள்? I’ve read a bit about thinai, kambu, kollu etc. I do know that the carb content in them are relatively high. If you know any studies about these foods, please let me know. We should remember that a couple of hundred years back, before the Industrial Revolution came to India, we did not have free availability of flours and sugar. We must also realise that the rice and other grains our ancestors ate were not scientifically modified. They didn’t eat polished rice. Nowadays, we don’t eat grain with the oil-rich germ and the fibre-rich bran; instead we eat polished, refined and bleached grain. Before the British destroyed our pasture lands, we had more meat. And when they destroyed much of our forests, we simply ended up with more agricultural land that gave them and us more grains. And that is why, in India and around the world, buying food for high-carb eating is cheaper. But keep in mind that the cost of medical care that arises from eating high-carb foods is much higher. Preservation techniques (like infusing chemicals and refrigeration) has also made availability of high-fructose fruits available throughout the year. When I was a kid, many fruits were ‘seasonal’, I rarely ate apples. Fruits are not what they used to be. They are scientifically modified to taste much sweeter (fructose is still sugar, you see), and they’re treated with preservatives to make them last much, much longer. I once had an apple in the fridge for 5 months!! Only the skin was slightly wrinkled. After peeling the skin off, the inside of the apple was crunchy and fresh. I saw a program in TV5 Monde, where an apple farmer showed how he treated the apples in a gas chamber for many hours to make it last for one whole year!! (The gas is toxic, and people don’t go into that chamber!!). 13. Can I do it? – you have to be strong enough to resist today’s prejudices against natural fats. Equip yourself with knowledge. – you need to be stubborn enough to stick to this WOE even though other people tell you that what you are doing is wrong. Equip yourself with knowledge. You may not be able to convince them of what you’re doing, but at least you won’t let them convince you, when you’re armed with knowledge. – you will also have to resist people who try to manipulate your feelings – they’ll say stuff like “Please do it for my sake, It’s just for this one day, It’s your birthday, It’s my birthday, It’s our friend’s/colleague’s/diabetic mother’s birthday, Won’t you eat this one dish just to make us happy?” These people rarely give up. Knowledge alone won’t help you stand your ground. You have to be emotionally strong to refuse such people. Please ask any other questions you have in the comments section… let’s find out the answers together.